How is technology impacting senior living and care? Marianne Aitken (right) and Audrey Ewalt talk at breakfast at Edgemere, where residents use an app to monitor activities, menus and other items of interest. Senior communities are busting the myth of the tech-helpless and joining the digital revolution. Previous attitudes about the senior living industry being slow to innovate are changing as seniors become more tech savvy, and as baby boomers loom as the next generation of customers, say professionals working with senior communities. With digital apps, computer systems and cloud-connected sensor technology, senior communities are turning to tech to help keep residents safe, healthy, mentally active and socially engaged. Some senior living companies are not just embracing technology; they’re looking to get ahead of the tech curve. Last year, Brookdale launched an Entrepreneur in Residence program, which invites startups to its communities for short stays to test new gadgets for the senior market. Recent resident entrepreneurs have tested wearable devices, virtual reality, an innovative walker, technology that helps seniors take their medications on schedule and even an innovative shoelace. When Heidi Frazier started in the senior living industry 23 years ago, the hottest tech innovation was cable TV in residents’ rooms, paid for by families, directly to the cable companies. Now, she’s amazed by gadgets like the It’s Never 2 Late (iN2L) computer system in place at HarborChase of Plano, where Frazier is director of memory care. “I call it our activity director on wheels,” she says. With the portable setup, residents and staff access an array of curated content: interactive brain games, exercise classes, travel videos, classic TV shows, worship services and more. Senior-friendly features include a large, adjustable-height touch screen and big type. “It gives residents the ability to manipulate the technology themselves,” says Kayla Gaiennie, HarborChase’s director of life engagement. Some residents are reluctant at first, but the ease of the system wins them over. “It shocks them, how easy it is,” says Frazier. The system also helps caregivers and therapists to easily find and share online material that relates to a resident’s past — a key avenue for engaging those with Alzheimer’s or dementia, who may retain long-term memories long after other cognitive abilities fade. And that might be something as offbeat as an Imperial Margarine TV commercial from the 1960s, which helped Carmen Vitton connect with a patient recently via iN2L. Marianne Aitken checks the community app that lists activities and news for residents at Edgemere. Aitken likes the way she can surf the app, which broadcasts a rotating bulletin board of announcements. For Marianne Aitken, new technology allowed her to follow the Iditarod. She and other independent living residents at Edgemere in Dallas have tracked the dog race in Alaska ever since meeting a late resident’s granddaughter, who competes every year. When Edgemere added an in-house app earlier this year, lifestyles director Ashley Wessel posted daily updates on the race via the calendar function. Aitken appreciates the updates because, while she owns a computer, she wouldn’t know how to follow the news story online herself. In addition to using technologies offered by senior living communities, many seniors are bringing their own tech tools — cellphones, laptops and tablets — when they move in. 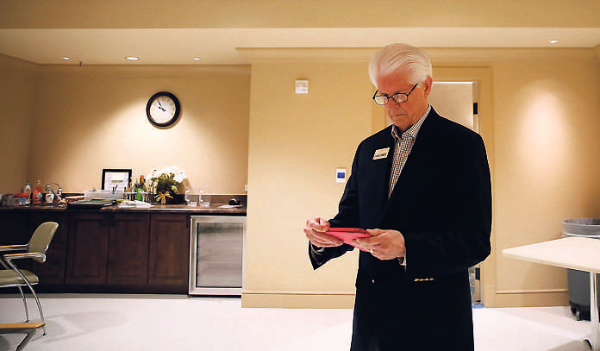 John Alagood, owner of Senior Care Authority of Dallas-Fort Worth, predicts that senior living communities could soon start adding tech concierges on staff to help residents maintain and upgrade their gadgets and learn new skills as technology progresses. 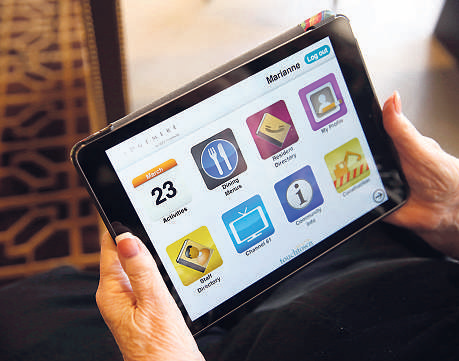 Personal tech keeps many seniors happily occupied, Heidi Frazier, director of memory care at HarborChase of Plano, adds. “They’re messaging their families on Facebook, or playing Candy Crush, or working on genealogy all day in their rooms,” she said. “I’m naïve when it comes to computers,” she says. Charlie Simmons, a resident and retired pilot, is comfortable with technology, having owned a small web design firm. Still, he was excited when the app was announced, and now uses his iPad to check the community’s daily activities or to find a staff member or fellow resident’s phone number. “If I need to find someone, I can find them quickly, and I don’t have to fish around in my file cabinet for a paper copy, which may or may not be up-to-date,” he says. The app can also be used to make maintenance requests, find a bridge partner, get weather updates, schedule transportation or — the most popular feature — to check the day’s dining menu. “If a resident wants to know what’s for dinner, or how many meals he has left on his meal plan, he can check the app, instead of calling the front desk,” says Ted Teele, CEO of Pittsburgh-based Touchtown, which developed the app for Edgemere. Teele says that addresses two of seniors’ top needs: to be as independent as possible, but also to be socially connected with fellow residents. It also eases the burden on staff; a resident with mild memory impairment might call the front desk to check on her dining plan several times a day. “When residents can help themselves, they feel more independent and the community saves money,” he says. Aitken likes the way she can surf the app, which broadcasts a rotating bulletin board of announcements. It’s an upgrade over the community’s in-house TV channel, she says. Edgemere resident Charlie Simmons, a retired pilot, is comfortable with technology, having owned a small web design firm. Still, he was excited when the community’s app was announced, and now uses his iPad to check daily activities or to find a staff member or fellow resident’s phone number. Another key area of innovation: monitoring technology. Automatic lighting, motion sensors and bed pads with pressure sensors installed in residents’ rooms can alert staff should a resident fall or get out of bed in the middle of the night. 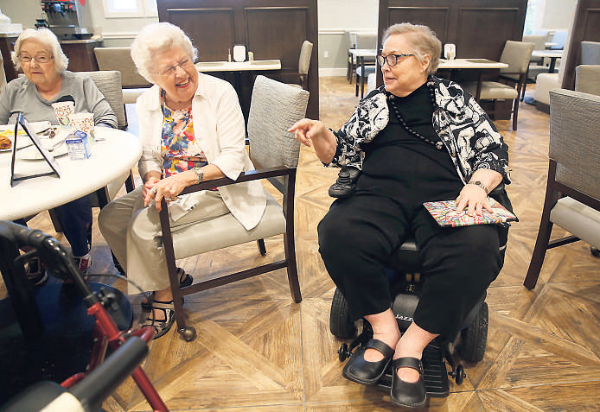 Along the same lines, researchers at the University of Texas at Arlington are testing a variety of technologies in a dedicated “Smart Care” apartment at Lakewood Village Senior Living Community in Fort Worth. The apartment is equipped with smart appliances, a device that tracks medication intake, and flooring with special sensors that measure and evaluate changes in gait and weight, which may suggest illness or injury. A special camera in a bathroom mirror monitors day-to-day heart rate, facial expression and skin color, all possible clues to changes in a resident’s health status. While the apartment’s primary aim is to help seniors live independently in their own homes, project leaders expect it will also pinpoint innovations that might work well in senior communities, too. “It is a living laboratory where we develop products that can be applied in different contexts as they fit best,” says Kathryn Daniel, program manager for Smart Care and a UTA associate professor. With monitoring technologies, developers walk a fine line in balancing seniors’ safety with their need for dignity and privacy. And what’s appropriate for a senior with Alzheimer’s or dementia may differ drastically from those in independent living. For example, a tablet-based system called SimpleC allows families to upload pictures from the residents or short videos with encouraging words, such as, “It’s about bedtime. I hope your day has gone well.” Or “It’s time for your medications.” Family photos can help trigger long-term memories, and familiar voices can reassure and calm a resident with dementia. Evidence-based studies have demonstrated good results. But for residents in independent living, who don’t have cognitive impairment, that approach feels intrusive. “In our surveys, residents tell us the last thing they want is tech that allows their children to nag them,” Teele says. John Alagood, owner of Senior Care Authority of Dallas-Fort Worth, helps families find and choose senior care. He thinks that technology might best serve to inform families, especially those with seniors who are too frail or memory-impaired to speak for themselves. Technology that tracks daily care, such as the times when medicines are dispensed, or how often a resident has been bathed, could reassure families that their loved ones are receiving the promised level of care. Monitoring gadgets can also be a double-edged sword, he says. While they can help caregivers follow a resident more closely, they can also lead staffers to become complacent and check less often, assuming the resident is OK if no alerts are triggered.